Many Doctors Oppose this regulation. Also, if you have gotten sick from a flameproof mattress we would like to know. As of July 1 2007 all mattresses nationwide, including crib, must be flameproof and contain toxic chemicals. Please help get the word out. "Many manufacturers are predicting a backlash once consumers start to investigate what's really lying under their sheets with them." "Ironically, mattress workers are coming forward and admitting they are getting sick simply handling the new chemically-laden materials"
Even before the July 1 2007 deadline most new mattresses sold nationwide, and all mattresses sold in California since 1-1-05 have already contained toxic chemicals to meet the new law. There are no labeling requirements of the chemicals in beds. All mattress makers will claim they use no chemicals, but the CPSC documents prove otherwise. Click here to see the CPSC table of chemicals used, and here to see their table of the amount of poisons absorbed daily from flameproof mattresses. If you want a clean bed we recommend a bare waterbed or our sponsors www.PrescriptionBeds.com and www.Strobel.com. Fortunately, the law allows Doctors including Chiropractors to prescribe toxin free beds. Prescriptions are easy, save you the sales tax, make the mattress set tax deductible, and you can use your health savings account. In their Jan-06 Risk Assessment the CPSC proves the average adult will absorb a daily dose of .802 mg of Antimony (Arsenic), .081 mg Boric Acid (Roach Killer), and .073 mg DBDPO (Deca) from flame proof mattresses, every night. Plus they say five year old children will absorb .5 mg Antimony every night, this is 63 times more poison than the EPA says is safe. Younger children were not studied. Short version, 21 selected pages highlighted. The highlighted lines are a quick read. Plus, Children under age five excluded from risk assessment. The CPSC assumes all these children will be protected by a vinyl sheet over their mattresses due to bedwetting problems, and that this will protect them from exposure to these known acutely toxic chemicals. There are no labeling requirements. Parents will never know their new mattresses contain toxic chemicals. Unlike other flame retardants that we initially think are non-toxic like Asbestos PCB's and PBDE's, and later find them harmful, we already know these are acutely toxic and cancer causing. Boric Acid, also used as Roach Killer, is a known reproductive and developmental toxin, a known respiratory irritant, Demonstrated injury to the gonads and to the developing fetus. high prenatal mortality, Neonatal children are unusually susceptible. There are already 6,463 U.S. cases of Boric Acid poisoning each year. One human exposure study showed reduced sperm counts and reduced sexual activity in humans. DBDPO, Deca, is in the family of PBDE’s, is known to bioaccumulate, is linked to cancer, and groups are trying to get it banned. 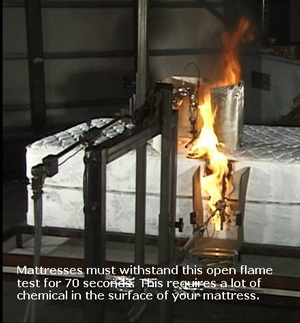 The CPSC has completed extraction studies that show the percentage of FR chemicals contained in various mattress flame barriers. (See CPSC Table 1, It shows 7 of 13 barriers contain Antimony, and 5 of 13 contain Boric Acid) They have also completed leaching and migration studies that prove these chemical reach the surface of our mattresses through the sheets, to be absorbed by our bodies, and base the above poison absorptions calculations on this data. See the rest of the short version of the story by clicking here. See the whole story by clicking here: Includes TERA comments and CPSC responses, omissions, errors, CPSC responses to public comments, and Conclusions. A new law already effective in California, and soon to be enacted nationwide by the Consumer Products Safety Commission (CPSC) requires mattresses to resist ignition from open flames, even though a 1973 federal law already requires all mattresses to resist ignition from burning cigarettes, and mattress fires have already declined by 68%. Since it requires toxic chemicals in the surface of all new mattresses to meet the new law, we think the risks of the new law outweigh the benefits. The CPSC hopes to save up to 270 lives annually after ten or more years, after all existing mattresses are replaced. This seems overly optimistic and the real number saved can be calculated to only 21 using the CPSC's own data. With 300 million people in the United States unknowingly taking the risk of sleeping in toxic chemicals, they avoid the one in one million risk of dying in a mattress fire. Using the 21 saved number the risk is one in fourteen million. By comparison annual US deaths are 6,091 as a pedestrian, 16,337 as a car occupant, and 17,550 from accidental poisoning by and exposure to noxious substances. Even before the new law, your risk of dying from toxic chemicals, is greater than your risk of dying in a car accident. See Odds of Dying. There is an entire specialty of real medicine that treats people poisoned by the toxic chemicals in our modern environment, real M.D. 's taught by top schools such as Harvard Medical School. These Doctors see first hand the pain, suffering, and death of these people. All of these Doctors oppose this law. Every life is important and it is hard to argue with fire safety. However, if this law kills even one more than it saves, it is clearly wrong. It has the potential to kill millions of people. If only 15% of our mattresses prove toxic -- 45 Million people will die. We know almost all the chemicals to flameproof mattresses are acutely toxic and many also cause cancer. The science of Toxicology uses high-dose short-term exposure on various animals to predict the effect of low-dose long-term exposure on humans. This is exactly the risk in mattresses, close chronic exposure eight hour per day for the rest of our and our children's lives. The developing fetus and young child is particularly vulnerable to certain environmental toxins. Over the past three decades, researchers have found that remarkably low-level exposures to these toxins are linked with less overt symptoms of toxicity—intellectual impairments, behavioral problems, spontaneous abortions, or preterm births. 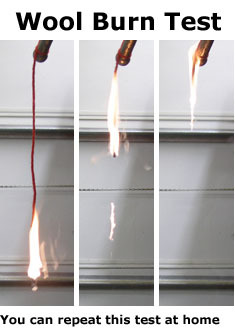 Antimony Trioxide is the most commonly used flame retardant in mattresses to meet the new law. Antimony is a heavy metal like Lead with similar toxic effects. Antimony is proven to leach from mattresses and linked to heart damage, cancer, and SIDS. 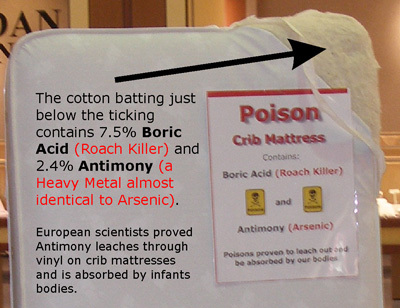 Boric Acid, also a roach killer, is commonly used as a flame retardant in mattresses to meet the new law. It is known to attack the developing fetus and testicles as it primary targets. In addition to death, birth defects, infertility, and sterility, studies show overexposure reduces sexual activity in humans. Children could be poisoned from sucking on a Boric Acid mattress. There are 6,463 cases of Boric Acid Poisoning in the US each year. Formaldehyde, Bromine, and other dangerous chemicals are also used in many systems. It is difficult if not impossible to find the truth. Even mattress manufacturers usually don't know which chemicals are present in their flame barrier systems. We can't find any, but even if safe systems exist, all mattresses must be safe or we will eventually harm or kill a percentage of our people. If 33% prove toxic, 100 Million people are harmed. If only 1% prove toxic, it is still 3 Million people harmed or killed. We should learn from our toxic legacies of the past. We have made previous mistakes with flame retardants such as PCB's banned in the 70's, Tris, Asbestos, and now PBDE's are being found in peoples bodies and women's breast milk in alarming and growing amounts. The chemical industry estimates we save up to 960 people per year with the 1.2 Billion pounds of flame retardants the US uses annually. Now we will be required to sleep in them too. We have already killed 300,000 people, and continue to kill 10,000 annually, with Asbestos alone. Consumers will be forced to pay an average of $100 more for every new mattress purchased to meet this law. The innerspring mattress industry through their trade association ISPA went to the CPSC and asked for this law. It seems clear it benefits the large companies by restraining competition, forcing the smaller companies out of business, and raising prices, revenue, and profits. Even the man who started and wrote this law in California, Whitney Davis, is now having second thoughts: "The Problem: the only chemicals they can use to achieve compliance are listed as toxic to humans by the EPA.” and "You don't know until 10 years down the road and there's a problem," he said. "We feel responsible." We have made progress with many Doctors and people opposing this law. The CPSC has received over 500 public comments opposing the law when they would normally only receive about 20 comments from interested parties on most proposals. We have gotten news for the issue from the Washington Post, San Francisco Chronicle, and many other newspapers across the country, as well as TV news from network affiliates. Please Help. Please vote here. Email the CPSC. Email and call your legislators. Email and tell your friends. Email, write, and call your local news media. It is never to late to try to stop this law and potentially save millions of people. Notice: The statements and questions contained in this website are not intended to convey allegations regarding any particular company, person, or association. Readers should conduct their own investigation of a company or association or person to ascertain the particular policies, practices, and motivations of that entity. I have reported what I believe to be true and correct to the best of my knowledge and opinion at the time of its writing in a free speech effort to avert a public health disaster.